Newsnight is the BBC's flagship news and current affairs programme, noted for its in-depth analysis and often robust cross-examination of senior politicians. The programme began life in January 1980, having been dreamed up the previous year, against a backdrop of political upheaval. "There was no Channel 4 News in those days, the Nine O'clock News was indeed a bit stodgy, and News at Ten had been doing its stuff for an awful long time. In other words, the opportunity to make a name for ourselves was there for the taking if we could just get our act together." Newsnight was the first direct collaboration between BBC News, then at Television Centre, and the current affairs department, based some distance away at the Lime Grove Studios. Amid fears that this would trigger staff cuts, the programme had a difficult birth - its launch was delayed for four months by the Association of Broadcasting Staff, at the time the main BBC trade union. 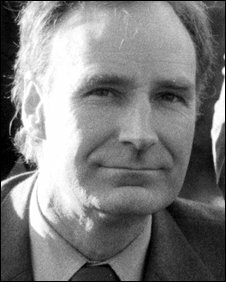 It finally went to air fronted by Peter Snow on Wednesday 30 January 1980. (Monday and Tuesday had been blocked by a last minute strike). Former presenters include Peter Snow, a regular for 17 years, the late Charles Wheeler, a revered veteran of the days of World War II broadcasting, and John Tusa, later boss of the BBC World Service, Sarah Montague and Jeremy Vine. 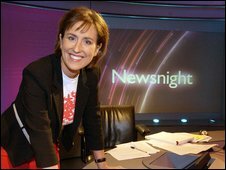 In the early years the programme had a second presenter, pejoratively referred to as the "'Newsnight wife syndrome", who read the news headlines and introduced minor items. Although women did appear on the programme from its earliest days, it was in 1985 that Olivia O'Leary became the first senior female presenter. The programme has had a single presenter since 1987, and is now wholly managed by BBC News. Until 1988, the start time of Newsnight was flexible, so BBC Two could screen a movie at 9:30pm to dovetail with the conclusion of the main news on BBC Two. The fixed time slot of 10:30pm was established in the face of fierce objections from the-then managing director of BBC TV, Bill Cotton. The programme has passed through the hands of 12 editors since its inception, and in that time news delivery has changed drastically. However, the identity and purpose of the programme remains indelible - Newsnight makes sense of the day's news, tries to explain the detail of current events and holds to account those responsible for them. Over the years, Newsnight has broken countless stories, produced ground-breaking and policy-shifting films, delivered many memorable interviews and the odd catastrophe, notably the decision to conduct a debate about the future of Germany against a huge firework party. All have been served up in Newsnight's indomitable style, exemplified by Peter Snow's magnificent sandpit which made its first shaky camera appearance in the very first programme as he explained the situation in the Afghan war with some model tanks. In 1990 a live cow jostled for Snow's attention in the studio during a story about the BSE crisis. Memorable interviews have included the World Cluedo Champion - dressed as none other than Colonel Mustard - over a giant Cluedo board, in 1995. The real mystery was how presenter Jeremy Paxman got through the two minute interview without laughing. Paxman's 1997 interview with the-then Home Secretary Michael Howard - during which he repeated the same question 12 times - became the programme's most notorious interview, and a piece of TV history. Paxman later admitted during the 20th anniversary edition of Newsnight that he had simply been trying to string out the interview because the next item was delayed.